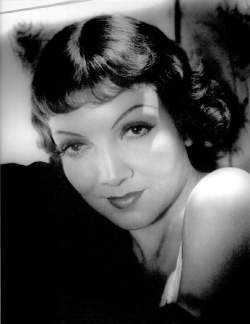 Claudette Colbert was one of Hollywood's best-loved leading ladies of the 1930s and '40s. She had a special talent for comedy in addition to dramatic roles and earned three Best Actress nominations and one Oscar over the course of her career. Not without a head for business, she was also one of Hollywood's highest paid stars of the late 1930s. 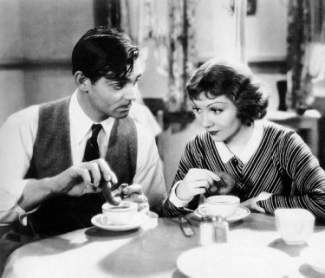 Colbert as rich girl Ellie Andrews tagging along with ruffian Clark Gable and learning how to dunk donuts in Frank Capra's screwball, romantic comedy IT HAPPENED ONE NIGHT (1934). The film was named Best Picture of 1934 and Colbert earned her first Academy Award nomination and only career Best Actress Oscar for her performance. 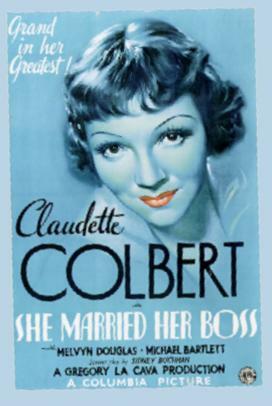 A poster from SHE MARRIED HER BOSS (1935), a light Columbia Pictures comedy featuring Colbert as a highly organized and efficient secretary who does just what the title says.